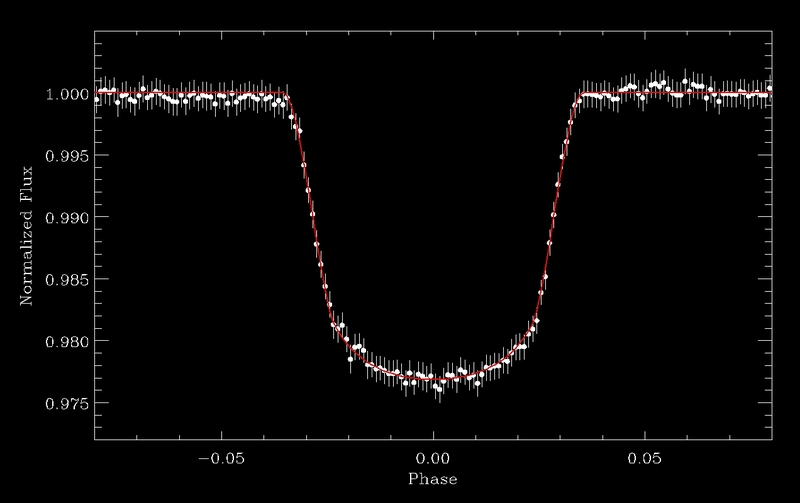 This plot shows the transit of the first exoplanet discovered by CoRoT: CoRoT-Exo-1b. The planet's transit results in a decrease in the luminosity of the hosting star when the planet passes in front of it, which is observed by CoRoT. The parent star is a Sun-like star. CoRoT-Exo-1b is a very hot giant planet, similar to Jupiter and with a radius preliminary estimated between 1.5 and 1.8 times Jupiter's radius (given CoRoT's excellent phometric data, most of the uncertainty is in fact due to the uncertainty on the radius of the parent star, which is still preliminary). Thanks to combined spectroscopic observations from the ground, the mass of the planet has also been derived and found to be around 1.3 times that of Jupiter. CoRoT-Exo-1b is orbiting its parent star in 1.5 days. All the sources of noise and disturbance have not yet been taken into account in the data. This first exoplanet was detected with an error of only 3×10-4 or 0.03% during one hour of observation. On applying all the corrections to the light curves, the error will be reduced to only 5×10-5. When combining observations of many more transits of the planet in front of the star, the precision will approach just one or a few times 10-5.